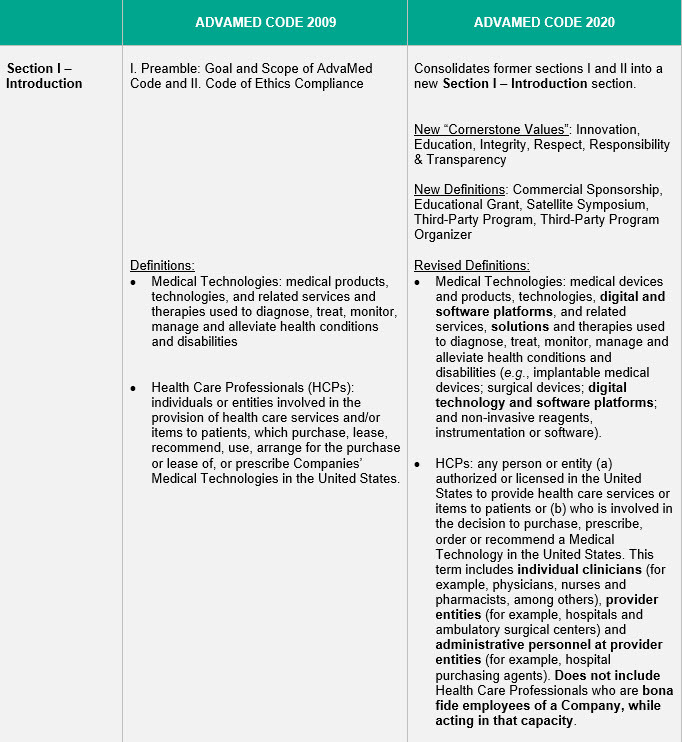 In its first update in a decade and effective January 1, 2020, the revised Advanced Medical Technology Association (AdvaMed) Code of Ethics in Interactions with Health Care Professionals (Code) in the United States contains new provisions and revisions to existing language that touch on many common industry activities. Changes include express reference to digital health and software technologies as covered by the Code, clarifications on topics such as “legitimate need” for consulting services, development of fair market value methodologies, and guardrails around research grants and charitable donations. The revised AdvaMed Code also introduces sections discussing jointly conducted education and marketing programs by health care professionals and companies, provision of technical support in clinical settings, and principles for communicating about off-label uses. A detailed appendix to this article summarizes the changes and clarifications section-by-section. Relationships between medical technology companies and health care professionals (HCPs) can help advance development of medical technologies, promote their safe and effective use, and foster medical research and education. These relationships can also create risk under state and federal laws, however, such as the federal Anti-Kickback Statute. The Advanced Medical Technology Association (AdvaMed), a medical technology trade association, originally developed a set of voluntary guidelines for its members to use in structuring their interactions with HCPs. The AdvaMed Code of Ethics in Interactions with Health Care Professionals in the United States (Code) was created in 1993 and revised in 2003 and 2009. 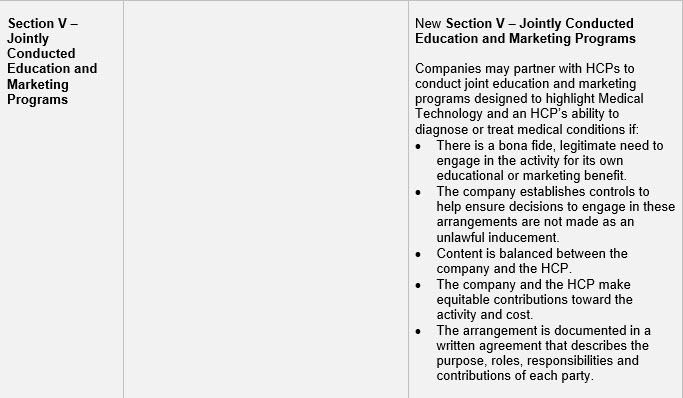 While the Code remains labeled a voluntary set of guidelines, AdvaMed requires its member companies to abide by the Code. Certain states, including California, Connecticut and Nevada, have made the Code’s provisions mandatory. In addition, disclosure databases and reporting requirements have been created under the federal Sunshine Act and in California, Massachusetts and Vermont. And as the industry is well aware, alleged violations of the federal Anti-Kickback Statute may provide a basis for whistleblowers or the government to file cases alleging that Code non-compliance is evidence of improper conduct. Effective January 1, 2020, the updated AdvaMed Code clarifies and refines its discussion of interactions between HCPs and representatives of AdvaMed member companies, which include medical device manufacturers and other medical technology companies. The updated Code adds new topics, incorporates related guidance previously issued by AdvaMed, and enhances guidelines on existing topics by bringing examples current, enhancing user-friendliness and clarity, and addressing the evolving nature of interactions with HCPs. The updated AdvaMed Code notes that it does not replace any laws, regulations or codes that contain stricter requirements. It refers medical technology companies to government-issued guidance on effective compliance programs and specifically lists the US Federal Sentencing Guidelines and guidance materials from the US Department of Justice and the US Department of Health and Human Services Office of Inspector General. 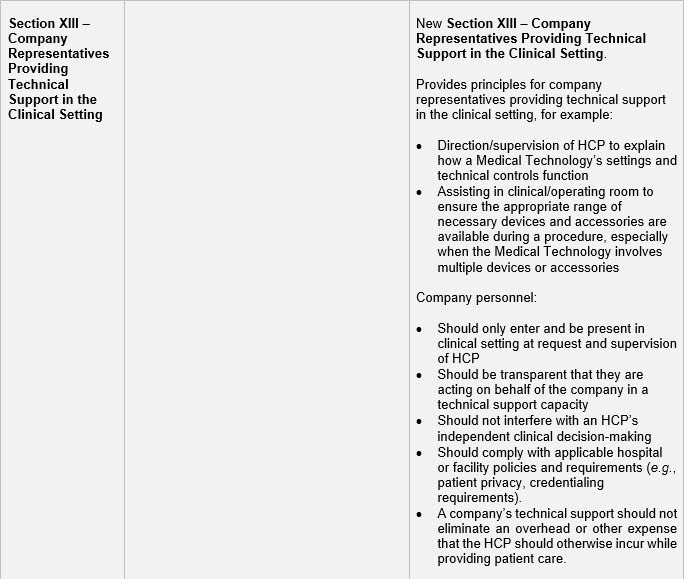 The new AdvaMed Code introduces three new sections, discussed below. There should be a bona fide, legitimate need to engage in the activity for the company’s own educational or marketing benefit. Content should be balanced between promoting both the company and the HCP. The company and the HCP should serve as bona fide partners in the program and make equitable contributions toward the activity and cost. The arrangement should be documented in a written agreement that describes the purpose, roles, responsibilities and contributions of each party. They should only be made by authorized personnel. The claims must be truthful and non-misleading. The claims must be clearly identified as off-label. The new Code also encourages companies to develop policies and controls that incorporate US Food and Drug Administration (FDA) guidance, judicial decisions and other relevant applicable authorities. The Code’s off-label communication guidelines reflect recent judicial opinions affirming First Amendment protections for truthful and non-misleading off-label speech. 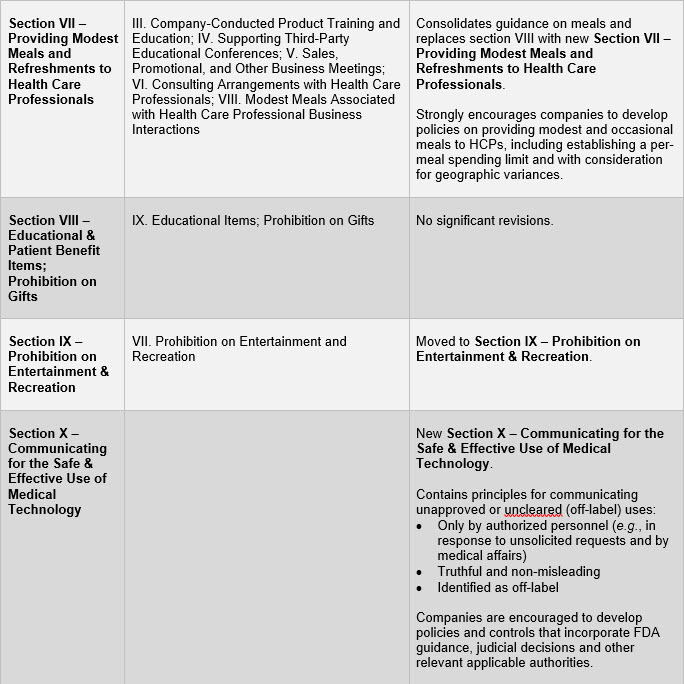 Companies should evaluate and implement these guidelines in light of existing FDA laws and HHS/OIG guidance on off-label communications. Additionally, a company’s technical support should not eliminate an overhead or other expense that the HCP should otherwise incur while providing patient care. Although expressly addressed in the Code, companies should also ensure that personnel have appropriate guidelines on managing off-label discussions, unsolicited requests or adverse events that may arise in the context of providing technical support in clinical settings. The new Code consolidates and clarifies content in the prior version. Key changes are summarized below. New cornerstone values, including innovation, education, integrity, respect, responsibility and transparency, are the basis for the updated Code. The Code directs medical technology companies to review all interactions with HCPs in light of these cornerstone values and to always avoid interactions designed to circumvent the Code. The updated Code applies to all interactions between medical technology companies and US HCPs, regardless of whether an interaction occurs outside the United States (such as at a conference or other event). The updated Code clarifies that for companies with multiple lines of business (e.g., medical devices, pharmaceuticals, biologics, consumer items or research products), the Code only applies to the company’s interactions linked to medical technology. The updated Code applies to all interactions with US HCPs related to combination products that include a medical technology component (i.e., combination device/biologic and device/drug products). Although the content regarding consulting remains mostly unchanged, the updated Code adds clarifying language regarding what constitutes a “legitimate need,” and includes an explanation of how to develop a fair market value methodology. 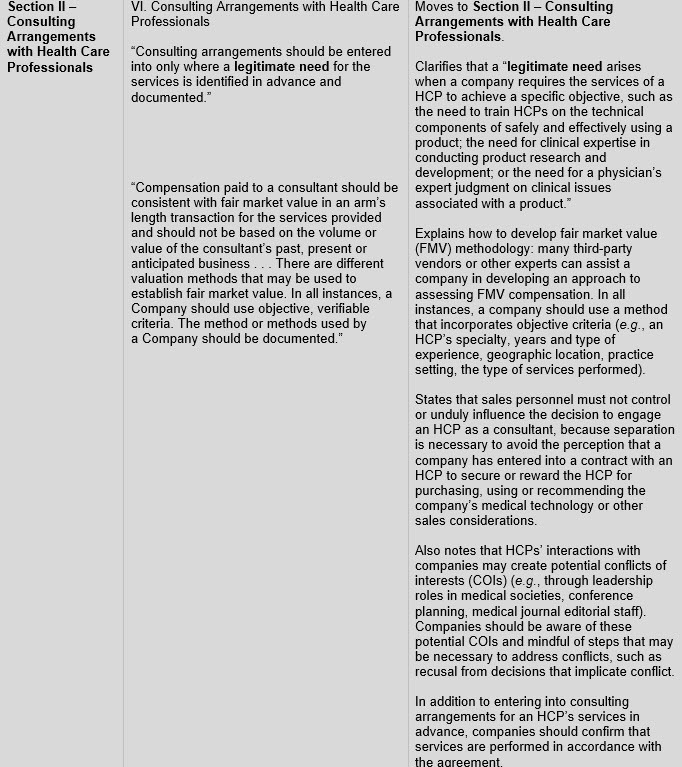 Specifically, the updated Code notes that a third party may assist in developing an approach to assess fair market value, and that a medical technology company’s fair market value methodology should incorporate objective criteria in all circumstances. Medical technology companies are encouraged to document their methods for evaluating whether compensation reflects the fair market value of the services provided. Company Programs: The updated AdvaMed Code consolidates sections on industry-conducted training, education and other business meetings into a comprehensive section that provides parameters for all industry-conducted programs. This section largely tracks the previous Code language. 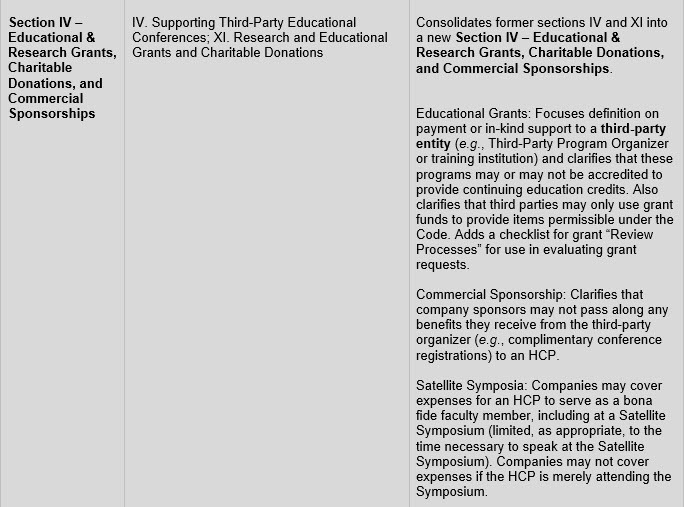 Third-Party Programs: The updated AdvaMed Code also consolidates sections regarding support for third-party education and charitable and research programs into one comprehensive section regarding grants, donations and commercial sponsorships. 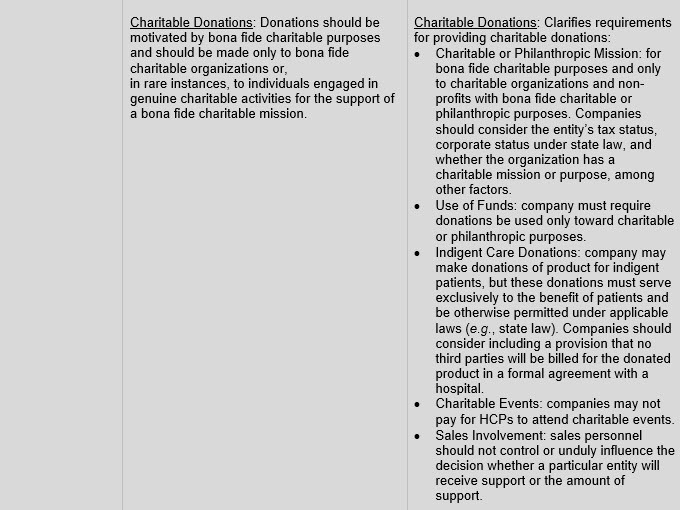 Among other changes, the updated Code focuses on meeting third-party organizer/accreditation standards; adds language to clarify that grant funds can, in turn, only be used by the organizer to provide items that are permissible under the Code (and not those that are impermissible); and includes checklists for use in evaluating requests. 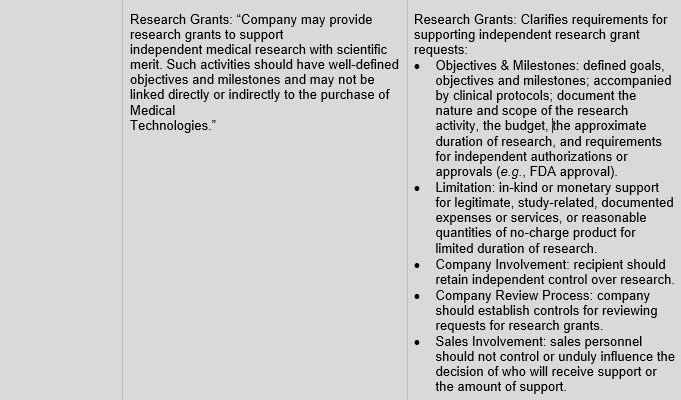 The updated Code also includes language that prohibits medical technology companies from passing along to HCPs benefits that the company receives in exchange for commercial sponsorship; further expands and clarifies the requirements for supporting independent research grant requests; and provides parameters for providing charitable donations. 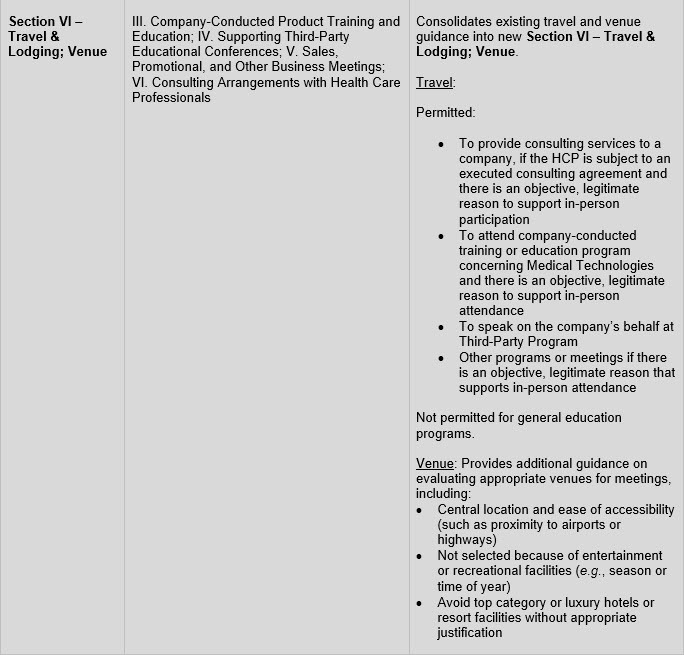 In addition to consolidating guidance on travel, lodging and venue into a single section, the updated AdvaMed Code clarifies that travel is not permitted for general education programs. It also suggests that companies avoid selecting a setting because of its entertainment or recreational facilities (considering, for example, the season or time of year of the event). In addition to consolidating guidance on meals into a single section, the updated AdvaMed Code adds language encouraging medical technology companies to develop meal policies and to review benchmarking information. Consistent with prior stand-alone guidance, the updated Code encourages medical technology companies to consider implementing controls, such as taking periodic inventory of consigned products and returning or removing expired product. To reduce compliance risks, medical technology companies and HCPs should consider whether the updates to the AdvaMed Code warrant changes to their policies, procedures and practices regarding interactions with one another. The delayed effective date of the new Code is intended to provide time to conduct this review. Veleka Peeples-Dyer is a partner in the law firm of McDermott Will & Emery LLP and is based in the Firm's Washington, D.C., office. She is an experienced attorney with an extensive background in the Life Sciences Industry, including Food and Drug Administration (FDA) regulation, clinical trials, manufacturing and supply, drug safety, licensing, product acquisition due diligence, health care fraud and abuse and compliance matters. Additionally, Veleka’s experience includes conducting internal investigations, developing and implementing legal and compliance training programs and advising on federal and state transparency, lobbyist and disclosure issues, including the Federal Physician Payments (Sunshine) Act. Veleka previously worked as in-house counsel to publicly-traded biotechnology and pharmaceutical companies. She served as a strategic business and legal advisor, counseling on the full range of research, development, regulatory, compliance and commercialization issues that biotechnology and pharmaceutical companies face. Veleka’s earlier corporate counsel experience includes working in the government contracts and utilities industries. Veleka understands the challenges clients face in this industry by providing strategic and practical counsel on the challenges and business complexities that life sciences companies face.